LornaLuxe has burst into my life like a perfectly formed, seriously well-dressed stick of dynamite. My first glance of LornaLuxe came at Donna Ida as I perused the shots the team had taken of denim lovers at London Fashion Week. 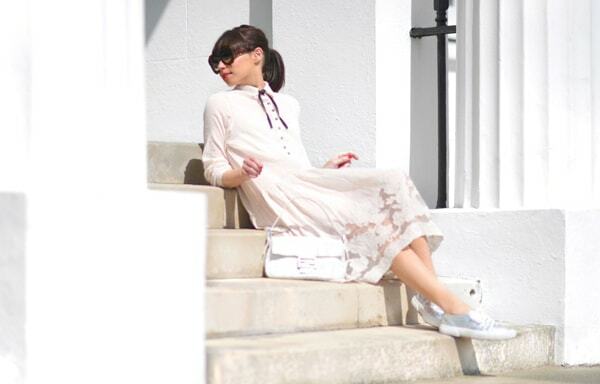 LornaLuxe was selected as one of our 'Best Dressed' and that blog post was one of our most successful to date. Yet, it was when I started NakedPRGirl that she really came onto my radar, as she, really 'got me' as we both have a fondness for being honest and authentic. On closer inspection I could see that LornaLuxe was intelligent, well-branded, cool, sophisticated, and, with the sheer number of high quantity images she was producing, working incredibly hard. On even closer inspection (and I inspected), I realised I couldn't figure out her real life name, and see what her background was, and find out, well loads of stuff! Sure I know she likes peonies, thinks she has a fat camera angle and looks amazing in a pair of shades but I want to know HOW she got in excess of 135k Instagram followers? What did she study? Who is snapping those pics? Soooo I came up with a ruse to meet her; I asked her to be the next person to be interviewed for my 'Getting Naked With' series. Meeting Lorna (ok first name basis now obvs) exceeded my expectations. She was wearing a typically fabulous outfit which she affectionately calls the 'A-Team' - denim skirt, towering heels and white shirt which she accessorised with MrLuxe plus her model friend and fellow Instagram star Eimear Varian Barry (oh yah people - I got the TOTAL SCOOP!) We met in The Botonist on Sloane Square on a beautiful sunny day, I am delighted to tell you that we shared a couple of bottles of rose and got on like a house on fire (both Northerners you see). There's something about Lorna that makes me want to aspire to be better, work harder, faster, edit my wardrobe...while at the same time she's so genuine and friendly, she's exactly the kind of person you want to be heading to party with and dancing on the table. 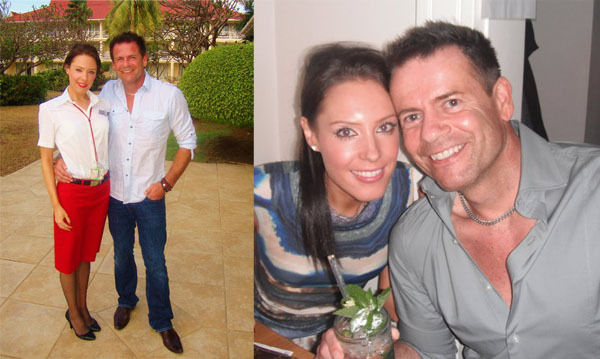 So here it is, an 'Instagram-love-story' as Eimear put it. Let's breathe it alllll in and luxe it alll out...let's get naked with the seriously straight forward, uber cool, really smart, bright and capable LornaLuxe. 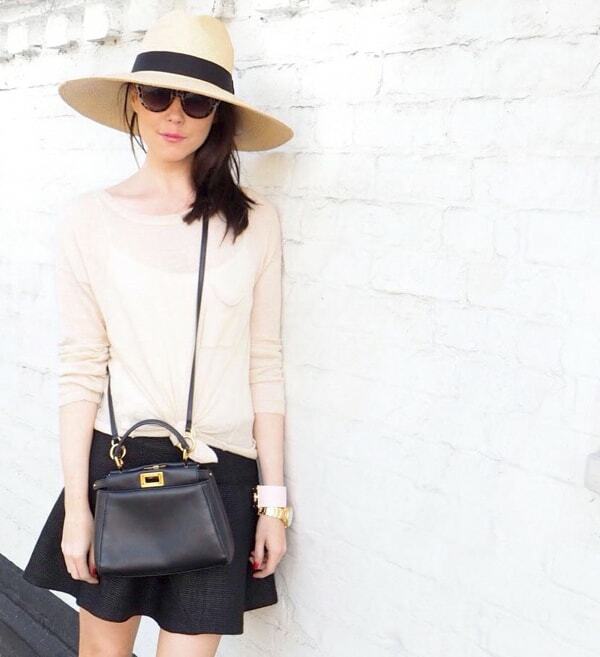 Fashion bloggers take note, this is how you do it! NakedPRGirl: What is your background? Where are you from? What did you study? LornaLuxe: I'm native to the North-West (a suburb called Trafford). It boarders the posh bit of Manchester, the rough bit of Cheshire. Even from an early age I set my aspirations high and worked hard at college to score a place and escape to Newcastle Uni. I read English and Music. I'm also now fluent in Geordie and real ale plus I can withstand gale force winds whilst wearing only a negligee and clutching a kebab. NakedPRGirl: Before you became Lorna Luxe did you have a normal 9-5 job? LornaLuxe: After uni, I headed down south and took up a career as cabin crew with Virgin Atlantic. I did 8 years jet-setting and cocktail sipping. It was a champagne lifestyle and lemonade wage scenario but I loved every second. Once I married J, I decided to take a break. A year later I hit 30, and I/we both actually decided I needed some stimulation so I began working for Rockett St George - an online homewares shop. Jane and Lucy the owners took me under their wing, I learned fast, worked hard and paid attention to as much of the business as I could. It was an intense work environment but when I left, it was with a very thankful heart to them both. NakedPRGirl: What excited you about the fashion world? Did you seek it out or was it organic? LornaLuxe: The fashion world was/is for the most part off-limits to someone like me, which is why initially I veered away, documenting more lifestyle content on my social media and then blog. It was as my Instagram really took off that I decided to focus on the areas I got the most enjoyment from - what I wear being one of them. Sharing my outfit-of-the-days on Instagram for example still fascinates me now, it's such an engaging platform where reactions go from gushingly sweet to brutally honest. I'm growing a thicker skin by the day. NakedPRGirl: How did you come up with the name Lorna Luxe and your catchy brand strap line is 'breathe it all in, luxe it all out'? LornaLuxe: In short, my car number plate was a variation on the word luxe and so it quickly became my nickname. I kept it when I chose my first social account on Instagram and then when I blogged it felt easier to keep it all aligned. The quote was the first thing I came up with and I'm just too lazy to change it - I welcome any ideas. NakedPRGirl: Your Instagram numbers are huge, how did you experience such a huge growth in such a short space of time? LornaLuxe: I was incredibly fortunate, I'd seen a steady growth, and then Instagram contacted me and for two weeks supported me as a Suggested User - their way of promoting accounts they believe are worth a follow. I'd never heard of SU before that, once I'd Googled it and read the infamous attrition to numbers after SU. I made a conscience decision not to over think or change my style. It is what it is and fortunately, I've continued to grow. NakedPRGirl: I love the way your Instagram feed is like a story, and all nicely linked, do you plan everything in advance? LornaLuxe: In short, yes. Even if I don't plan the content, I have colours and themes in mind. I also realise the power of repetition and familiarity. It's striking a balance between the things in your style that make you recognisable and the moments in time that are spontaneous and interesting. Instagram's a bit of a first world struggle for me... I'm frustrated and inordinately obsessed in equal measure. NakedPRGirl: How would you describe the LornaLuxe brand and what image do you strive to create? LornaLuxe: Lornaluxe is very much me in edited bite-size chunks. I feel as though my branding is not even something I'm consciously aware of. I'm super aspirational, I like nice things in nice places and usually seek out the pretty places to eat and the cutest shoes to wear. I reckon most people who follow me are interested in seeing what I'm up to because they know it'll be anything other than dull. NakedPRGirl: Do you think of your role as a blogger to be part marketer? Do you look at collaborations and features in the press as reaching a new audience? LornaLuxe: 80% of the brands that reach out to me have very little or no exposure on social. I've seen a shift in the brand strategies of smaller independents. Seeking out social only campaigns as a way to hustle their way into the mainstream - completely ignoring traditional marketing. The power of Instagram is all too apparent when you see influencers seeking to grow their brand with as much gusto as the brands themselves. And as a consequence, most bloggers myself included, respect the potency of brand affiliations. It can dramatically increase a bloggers traffic as much as boost a brands sales. And all overnight. I always look at a brands social output, as much as I do their product before I discuss collaboration. NakedPRGirl: Where are your favourite places to shoot that reflect your brand? LornaLuxe: South Kensington... Marylebone... Kemp Town in Brighton.... Basically anywhere WHITE. NakedPRGirl: How has Fashion Week evolved to become an important part of your work? 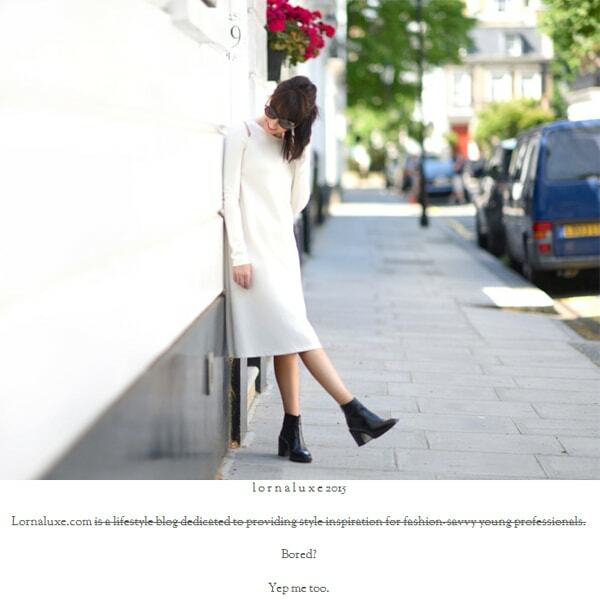 LornaLuxe: I use Fashion Week as a way to network with other bloggers/editors/influencers. I sometimes pass up on my show ticket to hang outside nattering to photographers. They're an integral part of getting your face in the right place. That said, I realise I can document shows from a different perspective if I've seen them first hand. I've become more focussed on which shows I want to talk about, which shows reflect my aesthetic and which shows are interesting to my readers. In short, If I'm honest, the show I pay most attention to is my own. What I'm wearing is always the most documented aspect of my work. I'm convinced my readers/followers will seek out Susie Lau for the actual nitty gritty or stalk Adam Katz-Sinding & co. for the Pinterest worthy pics. NakedPRGirl: Do you plan your outfits in advance in order to stand out against a sea of other fashionistas? Do you have an item in particular that has proved popular with photographers? LornaLuxe: The pressure - panic week I call it - invariably leads me sobbing into my Saint Laurent’s and clutching closet straws from the depths of Mum's wardrobe. You HAVE to show your style in every look, always with originality. I've tried it all, big hats, big totes, bright colours, ridiculous shoes. Truth is the more comfortable you feel the more the lens wants to capture. My best selection to date was at LFW last September when I wore a white silk Stella McCartney shirt dress and over the knee Choo's. Simple but super effective. NakedPRGirl: How important is networking to you? 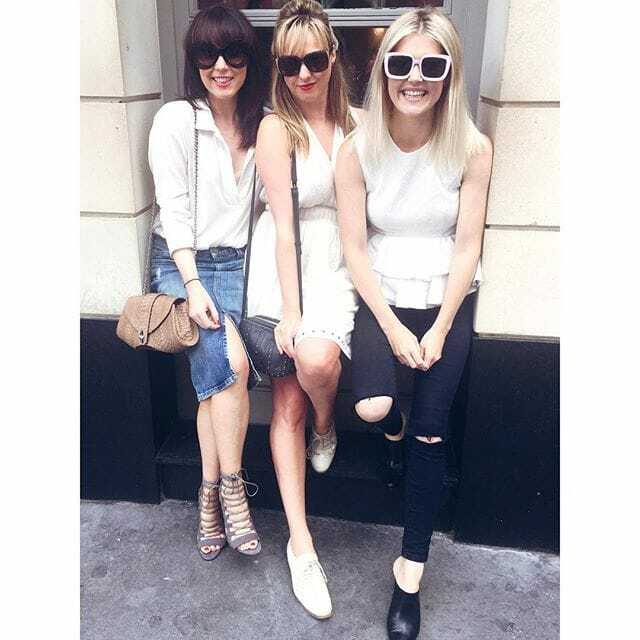 Which other fashion bloggers, PRs or journalists do you work and hang out with? LornaLuxe: I love networking, I enjoy the camaraderie that bloggers share. We all realise how relentless the industry can be, it's a bit of an assault course to the senses and you're in a personal race to do the best you can. I put plenty of bloggers on pedestals and it's always because they've earned it. I've a dozen blogger acquaintances spread gloabally I know I can rant with over Twitter or wink at on Instagram. On home soil, I'm incredibly fond of cocktail o'clock with Tres Monikh, Lydia E Millen, Silk and Suits and Eimear VB. Where I can, I've formed real friendships with industry PR's and writers who I know will watch my back and keep me in the loop - it's a two way thing and those allies are priceless. NakedPRGirl: Do you think the arguments over whether bloggers should be accepted on the front row are over now? NakedPRGirl: When your Instagram had achieved great success, you launched your blog, what prompted that change? LornaLuxe: Credibility mainly, to have a face for my ideas that I owned and had a dot com. I was craving an output which allowed me more control and activity. I'm in my own world on lornaluxe - and I love that I can change anything I want and edit the bits I don't. I often cull blog posts I've written in the past. It's quite a therapeutic venture owning a blog. NakedPRGirl: How do you structure your working day as a blogger? Do you spend a lot of time being techy and working on the back end? LornaLuxe: I didn't to begin with, I had no idea what SEO was - I still don't understand all of the back end to my site but I monitor as much as I can and I make decisions on my output based on Google Analytics. Most days are mainly filled with events and meetings. It's in the evenings that I start to write and explore my creative side - when the house is silent and the guilt from not answering emails/texts is to a minimum. NakedPRGirl: Is it hard to monetise what you do? NakedPRGirl: Do you have any advice for aspiring bloggers? LornaLuxe: If you can't be different be better. If you can't be better be different. NakedPRGirl: What are your fail safe tips for taking a good picture? LornaLuxe: Make the most of natural daylight. For shooting flatlays take from directly above as this is more attractive to the eye. I rely heavily on a number of phone apps which let me alter the colour, brightness and generally enhance my images image. NakedPRGirl: I hear your photographer is a significant person in your life...tell me more about the man behind the lens! How did you meet? Do you think it's essential to have the right snapper who understands what you're trying to create? LornaLuxe: We met in a bar, he was super handsome with kind eyes and good teeth. We've been married for nearly six years and he's my best friend in the whole wide world. But yeah, he's morphed into my superstar shutterbug and still maintains his own career and husbandly duties. The blog wouldn't exist without his commitment and captures. NakedPRGirl: You have super luxe pieces in your wardrobe, do you think it's important to try and buy designer? LornaLuxe: I think having quality over quantity is a mantra I've maintained mostly because it's failsafe. Though I believe even one beautiful piece of luxury in the closet can make you feel a million dollars. Buying luxury accessories is such an easy place to start. I love the growth in luxury resale sites and the fact bloggers - even me - are selling their pre-loved designer wares online. Now more than ever anyone can own a piece of super luxe for less if needs be. NakedPRGirl: Are there any brands you'd love to work with? LornaLuxe: Small Luxury Hotels - I literally plan my vacations around their selections and someone who spent their twenties living out of a suitcase, the wanderlust is very much still alive. Travel is next on my blogging itinerary. Follow LornaLuxe on Twitter, Instagram, Facebook, Pinterest & Blog Lovin. Check out her Podcast with Wobble here.